A delegation from Christian Council of Sweden of different Christian denominations, visited India in January 2018 coordinated by Mr. Henrik Rosen. They were interested to learn about the Freedom of Religion in India and visited Churches and Christian centers in Delhi including CBCI Centre. As a follow up of the visit , Mr. Henrik Rosen visited Catholic Bishops’ Conference of India, Office for Dalits and Backward Classes Fr. Devasagayaraj, National Secretary and Sr. Robancy the Program Coordinator. Fr. Raj explained the status of the Dalit Christians in India and the Religious freedom of the Dalit Christians. Sr. Robancy briefed the role and challenges of the Dalit Christian women. The Dalit Empowerment policy of the CBCI and the activities of our office were discussed. 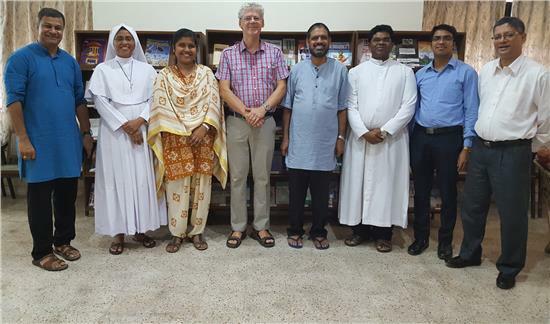 Mr. Henrik also met Sr. Talisha, Secretary for CBCI Women Council and Most Rev. Theodore Mascarenhas, Secretary General of the CBCI and the CBCI Fathers.